BBC NEWS | UK | Northern Ireland | Howzat for a new cricket album? Howzat for a new cricket album? Football has been the subject of many hit singles, but in the last 30 years only one song about cricket has made it into the charts. That was Rory Bremner's N-n-nineteen in 1985. Released under the name, "The Commentators" the song celebrated a West Indies win over England with Bremner impersonating cricket commentators. 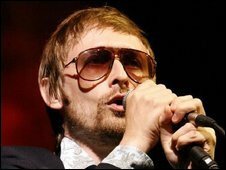 However, through a mutual love of cricket and music, The Divine Comedy's front man, Neil Hannon and Dublin singer Thomas Walsh, are hopefully going to put cricket in the charts once more. They have recorded a whole album of cricket songs, called The Duckworth-Lewis Method, with songs about the IPL, and an ode to the role James Anderson currently holds in the England side. The Duckworth-Lewis method is a cricketing term used to help decide rain-interrupted one-day cricket matches. It means a result can always be reached in a reduced overs match. Tracks on the album include The Age of Revolution, Jiggery Pokery, The Nightwatchman, Meeting Mr Miandad and Test Match Special. Hannon said he wrote Jiggery Pokery based on "Shane Warne's amazing delivery in '93, the bowl of the century". Describing Warne as "one of the greatest players of all time" it seems surprising that the song ends with the lyrics, "I hate Shane Warne." However, Hannon is quick to point out that he does like Shane Warne and that "it's just music, it's all fiction." Hannon, born in County Londonderry to a Church of Ireland clergyman, said he fell in love with cricket in his "wilderness years". He said: "I got into Test cricket and it sort of saved my life." For Thomas Walsh it was his first cricket set as a child that got him hooked, "I just fell in love with the game when I got that set." Hannon said: "It's about time the sport of the gods got a whole album dedicated to it." The Duckworth-Lewis method is due to be released in time for the Ashes this summer.